Divida su viaje de Skopje a Tirana con una excursión de medio día por Ohrid. Viaje cómodamente en un vehículo con aire acondicionado desde su hotel de Skopje hasta el lago Ohrid. Con un guía, explore el área del puerto y las numerosas iglesias que salpican la ciudad, como Santa Sofía, la Iglesia de la Sagrada Madre de Dios la más gloriosa de San Clemente y San Pantelejmon. Después de su recorrido, continúe hasta su hotel Tirana. Transfer driver excellent and guide appreciated but as such an early start would have preferred a break before quite an intense, long walking tour of Ohrid. Unfortunately weather was not good but the place is delightful and a gem. Having the opportunity to see Albania because of the drop off, this should definitely should be a transfer to consider for those who wish to see the Balkans. A perfect way to travel between Skopje and Tirana. 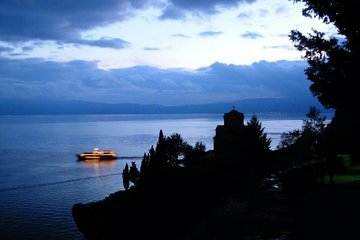 Ohrid is definitely worth a visit and being at the halfway point, it's a great stopover. Mickey the driver was extremely courteous and professional, while Peter, my guide in Ohrid was full of interesting tidbits of information. The scenery was simply beautiful too. As transfer services go, this one is highly recommended.